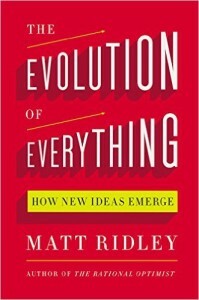 The Evolution of Everything begins with an intriguing idea – that the conversational use of “evolve” is accurate. Darwin’s evolution, Matt Ridley says, is like the special relativity of evolution, but that the process of evolving applies to, well, everything. According to Ridley, all the world’s best phenomena are bottom-up and never top-down. Inventions are inevitable, politicians are emergent properties of circumstances rather than cultivators of world events and so on and so forth. 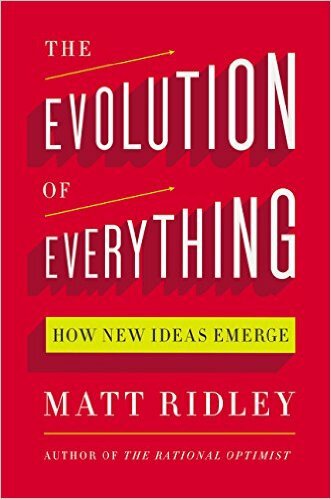 Throughout The Evolution of Everything, Matt Ridley shows himself to be a well-read, thoughtful person. The opening discussion on Lucretius is cause for reflection on how we might “swerve” in order to feel more comfortable with a new or difficult idea, setting the tone in a subtle way at the outset. Writing a book that covers everything is ambitious to say the least, and as you might expect there is quite a lot missing. Even so, the spread is generous and encompassing. From genes and population to morality and religion, there are provocative conversations on intelligence and the role of government and more – plenty to spark your curiosity. Ridley makes a number of assertions which are counterintuitive and challenging, requiring further research to verify or repudiate, like whether your parenting is doing anything at all to shape your child. This is all good fun for the nonfiction reader who aches to find more research to dig into. There’s just one element that may cause many readers put the book down in total exhaustion. Ridley seems to think that every single topic comes back to the open market, privatization and capitalism. This becomes a predictable trope where the focus switches from content to anticipation of just when the figure of capitalism will make its appearance, not unlike searching for Alfred Hitchcock in his films. Except imagine that once you spotted him, he featured as the new lead in the film. This is what Ridley does with capitalism, and it is damaging to otherwise interesting topics. In fact, The Evolution of Everything might be more accurately described by an alternate title: Cash Rules Everything Around Me: How Capitalism is Implicated in Everything. About two thirds the way in, Ridley derails completely. The chapter on population is about how liberals invented and supported eugenics. The chapter on government is about how the left always creates fascism. The chapter on religion is rushed – Ridley clearly wants to say something about the nature of belief in general but dedicates half the chapter to decrying the political attitudes toward climate change. This is all well and good and is not something Ridley is at fault for discussing, except that it has absolutely nothing to do with the premise of the book. By the time this screed is over, the last few chapters feel laborious, interest has waned and The Evolution of Everything hobbles unceremoniously across the finish line. Matt Ridley is mostly known for his book The Rational Optimist. His optimism shines through The Evolution of Everything as well, straying from military and prisons – two topics which you would think would interest him considering that the military represents a triumph of government and prisons represent a failure in privatization. His willingness to criticize everything except for the political right makes him seem dishonest, pouring adulation onto Margret Thatcher and Ronald Reagan – conveniently forgoing Reagan’s trickle-down economics, which would perfectly encapsulate the antithesis of his central claim that top-down decisions are always disastrous. However, The Evolution of Everything is still worth reading. There’s a lot to think about, a lot to disagree with and rebut. The claim that general evolution must be considered to properly understand our world is still compelling, even if the author fails to complete the circuit and switch on all the lights. Come bearing many grains of salt, and even if several of Ridley’s arguments exist only so that he can discuss the decentralization of government, there are gems to be found. After all, what’s the point of reading something you fully agree with?